"At Lush customer experience is our main focus. We always offer a personal and tailor-made experience. The PFM people counting systems provide us insight into the number of visitors which allows us to understand peak times, so we can always offer the best customer experience." Lush Fresh Handmade Cosmetics is a rapidly growing, campaigning cosmetic company with more than 900 stores in around 50 countries worldwide. Since 2001, Lush has established itself in the Netherlands and now has 10 stores. Lush makes effective cosmetic products from fresh, organic fruits and vegetables, the best essential oils and safe, synthetic ingredients. Lush not only strives to use the finest, the best and the safest ingredients, they also want to source it ethically. To make this happen, the buying team travels all over the world to search for the best natural raw materials, safe synthetic materials and essential oils. In addition, they are often faced with creative challenges such as making palm oil-free products or finding 100% recycled packaging. When purchasing ingredients, the effects on people and the environment are always taken into account. For this reason, they have been using the policy to take ingredients directly from the producers for years and they support fair trade and community trade initiatives. Lush is a professional organisation where the customer and the customer experience are the main focus. When making decisions in line with this philosophy, management makes decisions based on data. Years ago this resulted in the partnership with PFM as a supplier of people counting systems and footfall data. 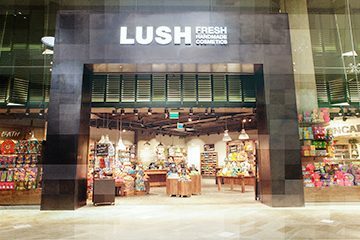 The collaboration has started in the UK, where Lush was founded. With its expansion in Europe, PFM has grown as a partner in providing footfall data. The question was clear and unambiguous: Understanding footfall data to increase conversion and plan staff effectively. Each location of Lush is equipped with a PFM people counting system. As a result, the management of each location is aware of the number of visitors and the peak hours of each day so they are able to plan more effectively and offer the right customer experience even at busy times. Meanwhile, over 200 Lush stores in Europe are equipped with PFM people counting systems. With the data from these systems, both the central management and the shop manager are able to see how many visitors a location attracts. Click here for more information about Lush.